Lehr sign the MoU as Egyptian Ambassador Mohamed Tawfik looks on. Cultural Heritage Inventories: conducting the first nationwide inventory for all excavated antiquities- led by Egyptian archeologists and the Ministry of Antiquities- and made widely available through publications on the web. Physical Site Protection: training officials at the sites and supporting programs to better protect sites physically where necessary. Ancient Records Digitization: scanning ancient records to protect the objects and ensure accessibility on the Internet. Aerial Mapping: conducting nationwide mapping of all key archeological sites to serve as a benchmark for tracking looting and urban encroachment. Cultural Heritage Education Campaigns: designing and implementing cultural heritage education programs around major archaeological sites. Small Business Initiatives: promoting the development of small businesses around tourist sites to create economic incentive for their protection. He chose Cultural Heritage Inventories. 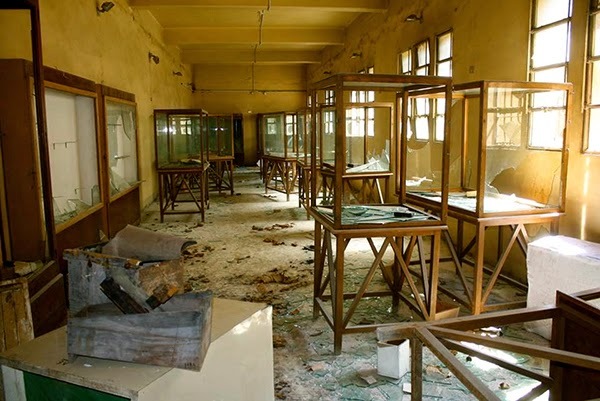 Egypt has a vast resource of materials in museums and storage facilities around the country, but the only registry they have is of the materials in the Cairo Museum. That project was created in 2009, using grants from the Mellon Foundation and USAID and was administered by the American Research Center in Egypt. But these collections make up a fraction of the material found in Egypt since organized archaeology began back in the 18th century with Napoleon’s expedition. Ministry officials estimate that there are hundreds of thousands of objects in museums and storage facilities around the country. And no list of what they are, where they come from, or where they are now. With attacks on the rise, it is critical that Egypt know have a digital record to assist with any potential recovery. It’s probably best to not think too much about how daunting a task it would be to try to organize this Council on Library and Information Resources (CLIR). CLIR is the leading institution on academic information and knowledge strategy in the United States. Chuck Henry is a longtime colleague and friend, who looks at these challenges through the lens of his engagement as a university librarian, information strategies thinker, and practical problem-solver. And now Chuck is lending a hand officially as an advisor to the Antiquities Coalition, http://www.theantiquitiescoalition.org/charles-henry/. need for inventories sooner rather than later. The Antiquities Coalition has already benefitted from Chuck’s advice as we move this project forward, particularly from his insights derived from CLIR’s Cataloguing Hidden Special Collections and Archives program. We are also discussing with the collections management software company EMu, the firm that provides the Cairo Museum with the platform on which they have built their registry and accession records, what it would take to launch a broader inventory. We believe the way to start is with a pilot program at another museum in Egypt and at one or two storage facilities, with a focused training program attached. Other goals include a possible online presence for these records, which would be a boon for the scholarly community, for K-12 educational opportunities, and for ways to present the material that would encourage travel and tourism to Egypt and help with economic development. We are approaching foundation and corporate supporters about funding, in order to raise $5,000,000 to create the capacity for this task, which we expect will be undertaken by Egyptian professionals. And we have stayed in close touch with Egyptian authorities, always keeping in mind that they have the ultimate responsibility for Egypt’s cultural patrimony. Dr. Henry says the creation of this inventory and database is something that information and library professionals, scholars and educators, funders, and those with an interest in the history and culture of Egypt will celebrate and encourage. We think its creation is a task worthy of the daunting effort.